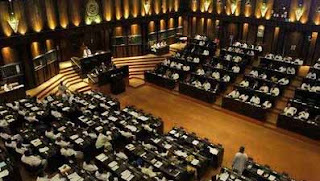 The impeachment motion against Chief Justice Dr. Shirani Bandaranayake was passed in parliament with a majority of 106 votes with 155 voting for and 49 MPs voting against it.Speaker Chamal Rajapaksa said that motion against the Chief Justice was passed in parliament.The impeachment motion against the Chief Justice was taken up for debate on January 10 and 11 while the vote was taken at 6.30pm today (January 11). The Supreme Court on January 01 had interpreted the constitution holding that a parliament Select Committee does not have the power to arrive at a finding against a Judge of a Superior Court, while the Court of Appeal on January 03 exercising writ jurisdiction quashed the decision of the PSC. United National Party announced that it would vote against the impeachment while the Democratic National Alliance and Communists Party of Sri Lanka decided to abstain from voting.